No, no, no...not an explosion involving a Paris-Roubaix fork. A exploded assembly view for said fork! 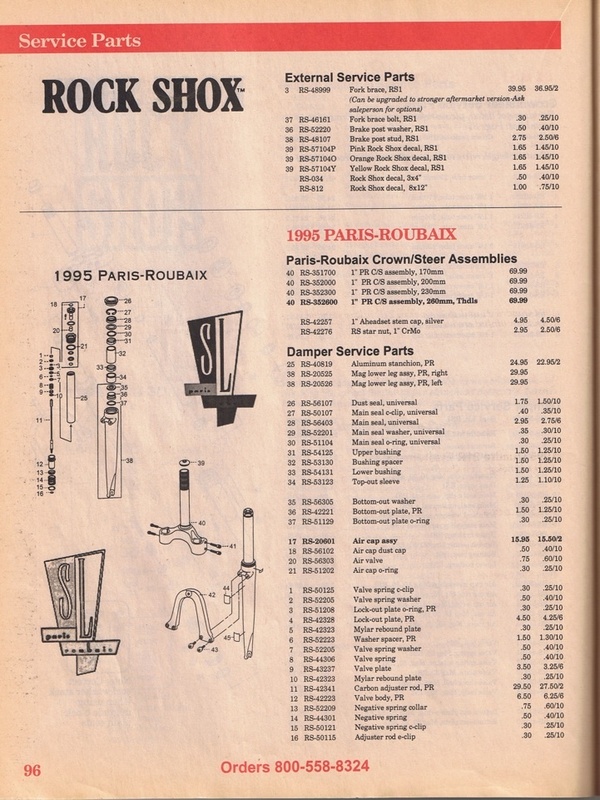 BTI's 1995 catalog contains diagrams for just about every suspension fork on the market at the time, including the Paris-Roubaix. Back then, you could use the diagram to order replacement parts. Now, you can use the diagram to lament that fact that you can't order replacement parts. Well The Paris-Roubaix parts are the same as the 1994 MAG21 and later years. Just a few things differ. If you search you can still get parts, or find a pair of MAGs to raid for parts. They are serviced the same as well. if anyone is really interested. sound like a good book you have though with some prices as well.